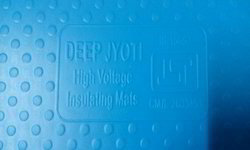 We are a leading Wholesale Trader of electric rubber mat and electric shock proof mats from Ahmedabad, India. Our range of precision engineered Electric Shock Proof Mats is a great favorite with clients in various sectors for their functional features. We source the range from trusted vendors. The Rubber Mats are fabricated by our vendors from premium quality materials in compliance with IS 15652-2006 quality standards.Electrical Rubber Mats offered by are used as floor covering around electrical panels as a precaution to protect the life and limbs of the workmen from possible leakage of current and short-circuit. Clients can avail the Electrical Rubber Mats in multiple colors like black red and finishes comprising plain, corrugated patterns. Because of their prime quality, the range is also used in Power Generation Plants, Sub-Stations and Workshops.